Blockchain, also dubbed distributed ledger technology is initially used to create crypto money like bitcoin or ethereum. However, additional to its initial purposes it is now a part of plethora of applications considering its cutting edge security and flexibility features. It is eulogized for its capability to create secure ledger of information that helps users prevent unauthorized modification of data. One of the advantages of blockchain is that it opens up a wider range of options for secure engagement between competitors by eliminating the need for trust between third party entities. Smart contracts incorporated with blockchain and inducted with the primary objective of automated escrow, can be partially or fully executed or enforced without human interaction. Potential of blockchain to speed up back office settlement systems familiarizes it in the banking and other financial industries including insurance. The concept of distributed ledgers can be used in cloud, mobile data environments, IoT, and healthcare as well. Major blockchain solution providers and their innovation labs engage in exploring more scope for the technology in the daily needs of human population. They are also planning to add the majestic touch of AI to blockchain systems to boost the advancement of related solutions. To help business providers in selecting promising blockchain solutions, a distinguished panel of prominent marketing specialists and analysts, along with CIOReview editorial board has assessed and shortlisted the companies offering pioneering technology solutions in the blockchain industry. This listing gives a comprehensive understanding of solutions that can be implemented to optimize your business process. 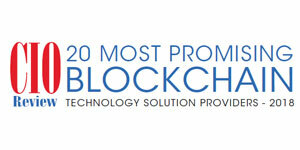 We present to you, our 20 Most Promising Blockchain Technology Solution Providers - 2018.